Flying into Shuttleworth with WW1 and Song of the WAVES! 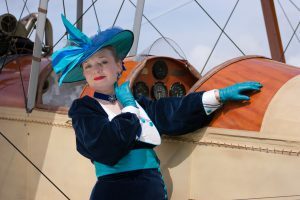 Hello every-one it’s just a very quick blog today as I’m between shows and I need to get on the road very shortly to perform for a garden party. This afternoon I will be singing the music of the 1960s and 70s and I still have a few things I need to prepare. 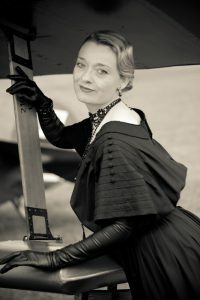 Going Edwardian with Reto Air Photographic! goes wrong it cause so many problems especially when you need directions and the people on the street are tourists and don’t speak English! Still we got there in the end! Afterwards it was straight onto A34 and down, along the M4 as I was in the recording studio last night just sorting out a few finishing touches for my 1940s showreel. I start filming the end of this month and I have another few films to want to add to my library which David and I will be working on in a few weeks time. 2018 is going to be a busy year I think with the commemoration of the end of WW1 and I’m already starting to get enquirers. Predicting trends is very important and I’m so pleased I invested in my Music Hall to Opera Showreel. It’s there for clients to see and if nothing else it leaves a documented record of what I can do which is very important. Me as a US WAVE! L & D Radio have asked if they can do and interview with me which should be fun to meet up with Alan again and as my shows finish early before the air show it will give me plenty of time. I shall leave my blog hear today as I need to get down to the post office. I was contacted 2 years ago by an ex American US WAVE who served during the Vietnam years. Her name is Linda Mitchell and she wanted a recording of “Song of the WAVES” – “WAVES of the Navy”. It would seem I’m the only person in the world who has a backing track of this song as I commissioned it into an arrangement for my US WAVES Show and the arrangement also includes Anchors Aweigh. WAVES of the Navy was written by Betty St. Clair and was designed to harmonize with Anchors Aweigh. Last night I was able to make a special recording for Linda which I must pop in the post today. 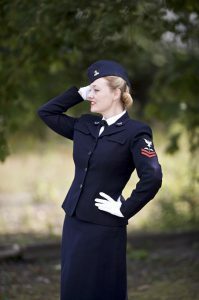 I have a feeling her Woman’s Military Group will appreciate this arrangement far more than a British audience as they will understand all the musical nuances like Liberty Bell and there is even a small reference to the Village People if you listen out for it!